Hilma af Klint: Paintings for the Future at the Solomon R. Guggenheim Museum | The Bottom Line "The Drawing Center"
Installation view: Hilma af Klint: Paintings for the Future, Solomon R. Guggenheim Museum, New York, October 12, 2018–April 23, 2019. Photo: David Heald. © 2018 The Solomon R. Guggenheim Foundation. 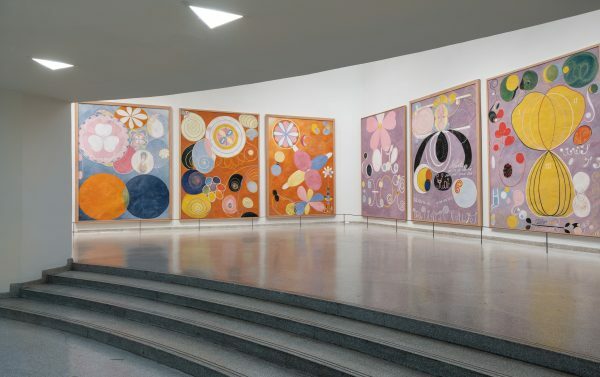 On-view through April 23, 2019 at the Solomon R. Guggenheim Museum, Hilma af Klint: Paintings for the Future is the first major solo exhibition of the artist in the United States. Featuring af Klint’s singularly spirtaulistic, abstract paintings and works on paper, the comprehensive survey encapsulates her six-decade search into the unknown. Interested in many belief systems popular at the turn of the 20th-century like spiritualism, Rosicrucianism, and theosophy, af Klint’s most prolific period came after she received a commission from a spirit guide she had connected with as a medium. Between the years 1906 and 1915 af Klint created 193 works that she titled Paintings for the Temple— a groundbreaking series that sought to represent the spirit of the world, an endeavor that involved a deep exploration into philosophies and theories that sought explain grand systems that ungird our world. Withheld from public view for decades, the paintings, per af Klint’s request, have only recently begun to be exhibited. The artist also stipulated that the paintings be presented in a spiral that ascended towards the heavens. The Guggenheim, with its iconic coiling architecture designed by Frank Lloyd Wright, poetically honors af Klint’s wishes. In the second year of af Klint’s Paintings for the Temple project, she created The Ten Largest, a series of monumental canvases sized at 10 by almost 9 feet. The scale of the paintings matches their ambitious content with each representing a phase of human life. 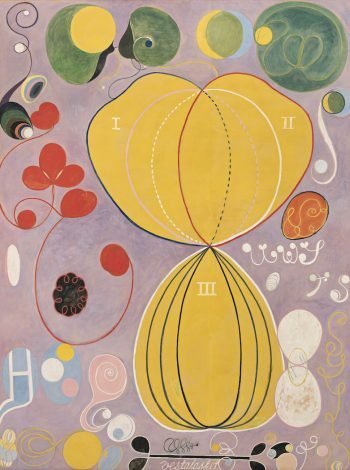 Using a visual vocabulary that assigned specific meanings to symbols and colors, af Klint sought to express human development through forms that are completely untethered to the material world. Af Klint derived imagery from Swedish folk art, scientific diagrams, and occultist symbolism, but her bulbous and sinuous lines enter into a new, mystical visuality laden with meaning. Painted in tempera on paper, Adulthood No. 7 offers a mystifying and schematic representation of this phase in life using diagrammatic shapes and colors that float beautifully on a light lavender background. The exhaustive dictionary of visual forms that af Klint wrote in her notebooks may offer some insight into the meaning of these wondrous shapes, but its essential knowledge is ungraspable and approaches only the brink of revelation. Af Klint searched her whole life for knowledge about the ways of the universe and did so through intensive study of burgeoning scientific movements of Darwinism and the discovery of subatomic particles. These disciplines paired congrously with her dedication to popular occultist philosophies like theosophy, which focused on attaining direct information of our world by contacting other realms. In 1896, af Klint and four other female artists formed The Five, a spiritualist prayer group that gathered to perform séances and collective automatic drawings. Through these practices The Five went into trance-like states during which they contacted spirits, whom they referred to as “High Masters.” Through one such spirit, af Klint received her commission to create a painting-filled temple. This call to action led to her groundbreaking stylistic shift from impressionism and landscape painting (from which she had earned a living) to an abstract aesthetic. Preceding the legendary modernists that art history has labeled as the founders of abstraction — Piet Mondrian, Wassily Kandinsky, & co.— by nearly a decade, af Klint’s renditions of the mysteries that lie around us are stunningly contemporary. 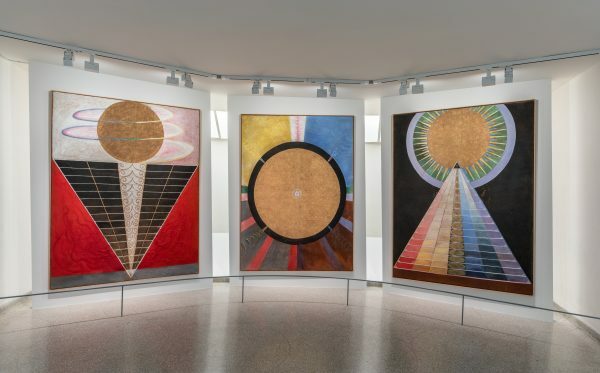 Af Klint’s Paintings for the Temple project culminated in 1915 with a trio of paintings that she named “Alterpieces,” and described as “the summary of the series so far.”[i] Painted in gold leaf, the importance of these three works vibrates off the shimmering surfaces of their grand forms. The “Alterpieces” represent the theosophical belief that evolution develops in two directions: elevating the physical to spiritual and descending the divine to our material world. The upright and inverted triangles express this idea with incremental staging of color hues that culminates in golden orbs. The eye-catching end to af Klint’s commission embodies a totalizing belief that evolution physically and spiritually shapes our minds, bodies, and the natural world we live in. Hilma af Klint: Paintings for the Future was organized by Tracey Bashkoff, Director of Collections and Senior Curator, with David Horowitz, Curatorial Assistant, for the Solomon R. Guggenheim Museum. The exhibition is on view from October 12, 2018 until April 23, 2019. [i] Wall text, Solomon R. Guggenheim, Paintings for the Future, Solomon R. Guggenheim Museum, New York, NY. [ii] Hilma af Klint, personal notebook entry (October 9, 1944): quoted in John Yau, Hilma af Klint, Outlier for the Ages (Hyperallergic, November 25, 2018).